Milan Tours Include: Our private Milan walking tours include the services of your private guide. 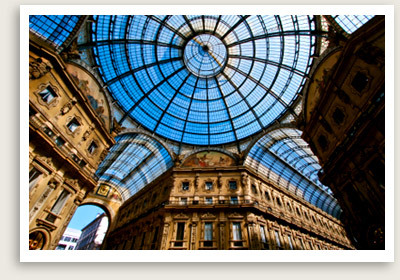 NOTE: We offer custom private tours of Milan. Custom tours of Milan can include the sites you desire. Enjoy a guided, private walking tour of Milan, a fashionable city, with a private English-speaking tour guide. This Milan private tour features the architectural and historic highlights of central Milan. You will start your tour with the Duomo, the city’s magnificent late Gothic cathedral, featuring the tallest Gothic vaults of any church in the world. The Duomo also boasts the world’s most extensive collection of marble statues, most notably the golden Madonna, which you’ll see on your way to the roof for a fantastic view of the cityscape. Your Milan guided tour will continue through the Gallery Vittorio Emanuele II — known as the world’s oldest mall — to the square of La Scala, perhaps the world’s most famous opera house. After your Milan tour ends, you will be well situated to continue to explore this magnificent city on your own and do some world class shopping!